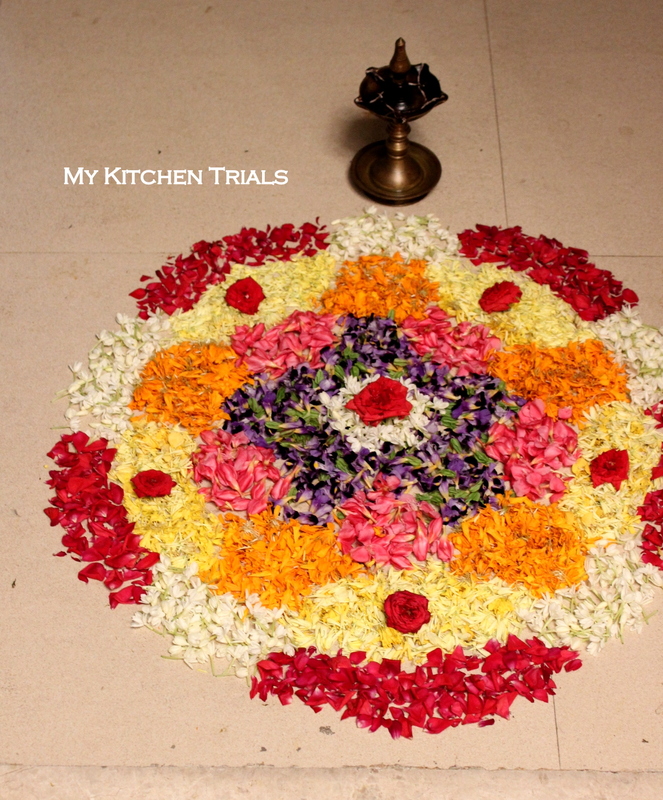 This is my friend’s pookkalam for Day 5 (Anizham) and we have just 5 more days to go till Thiruvonam :-). 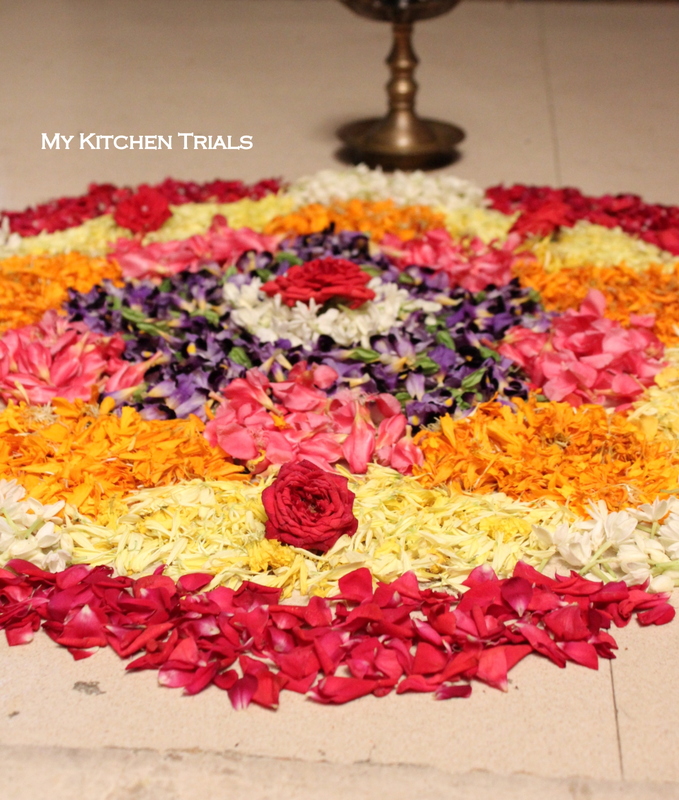 Enjoy the pookkalam before I delve into the ‘I’ of the day! Today’s letter for blogging is ‘I’. And the dish, of course, is Inji Curry or Inji Puli (Puli Inji). My mother tells me that there is a slight difference between the two – one has a bit more of chillies, the other has a bit more of tamarind (puli), but its more or less the same. As I have mentioned many times in this series, the method of preparation differs from one region to another. My mother gave me the recipe, but since her measurements were vague, I decided to check the ever reliable Edible Garden for the recipe. 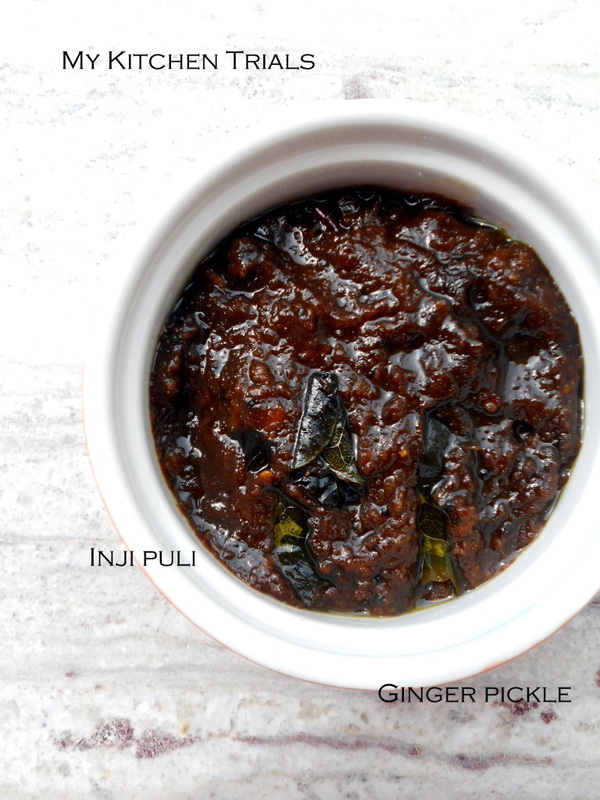 Inji curry/Inji puli is a must for Onasadya. It is served on top left corner, with other pickles. Like I mentioned, some people make three and some make four kinds of pickles. Inji curry is a must and is usually prepared on the day before Onam (on Onnam Onam – 1st Onam) or even a couple of days before that. Wash, peel and chop the ginger. Heat oil in a pan and fry the ginger pieces till light brown. Cut through the green chillies and toss them in at this stage. Fry for a couple more minutes till the ginger becomes brown and let it cool. Drain the ginger and chillies and grind them into a paste,but not a very fine one. Don’t add water. Keep aside. Let the oil remain in the pan. Heat the oil again and add mustard seeds. Once it splutters, add the fenugreek seeds and curry leaves. Once it changes color, add half cup of water to which the tamarind paste is dissolved (or half cup of tamarind juice, extracted from a small gooseberry sized tamarind). Add the hing, jaggery and salt. Let it boil for a couple of minutes. Add the ground ginger and let it come to a boil. Simmer and cook for about 10 minutes, stirring often, till the oil floats on top. Do a taste test and add chilli powder if spice is less or jaggery if its too spicy. Adjust salt, if required. Cook for a couple of more minutes and take off the heat. Once cool, store in a clean dry glass bottle. My all time fav recipe love it with curd rice can have it whole day urs is drool worthy click. Looks good. I have never tasted it but heard about it from friends! Thank you so much for posting Inji Puli. I had it once when I was invited by a nurse for Onam Sadya. It was perfect taste. yours looks exactly the same. I love anything gingery. It looks almost like our ‘allam pachadi’. Spicy, tangy & yummy! Looks tempting & yum.. Never tried this dish before & bookmarking it..
wow finger licking good!!! yum yum yummy!! Love the tangy puli inji! 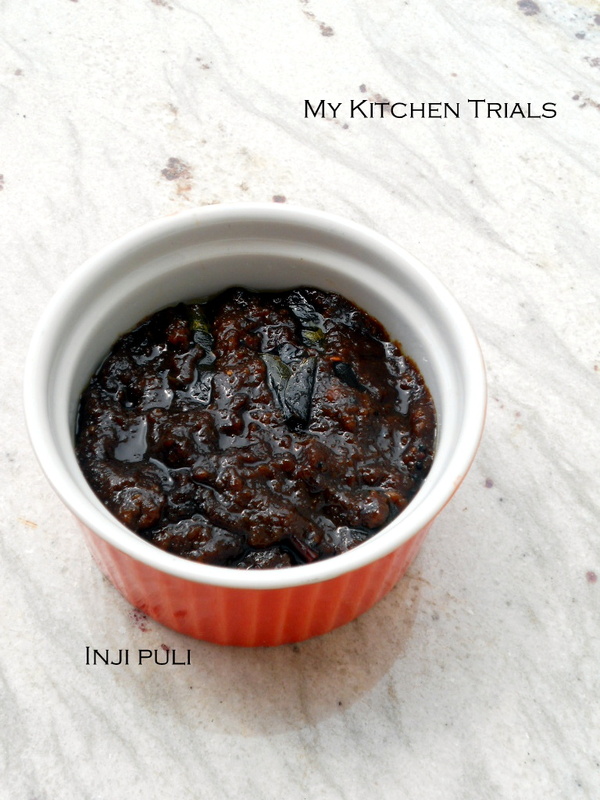 I learnt this recipe from my mother in law and simply love it…That bowl of puli inji looks very tempting Rajini! !